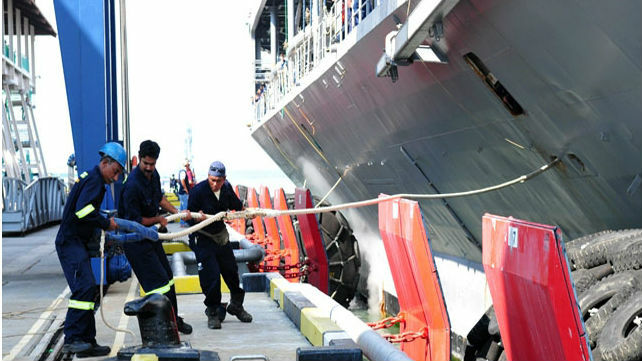 This image from the Glenn Defense Marine Asia website shows workers tending to a Navy ship. The Singapore-based defense contractor is embroiled in a fraud case. A former U.S. Navy captain who accepted money from a foreign defense contractor as part of a wide-ranging corruption scandal was sentenced Friday to six months in federal custody. Jeffrey Breslau, previously director of public affairs for the U.S. Pacific Fleet, pleaded guilty last year to a conflict of interest charge for surreptitiously assisting Leonard Glenn “Fat Leonard” Francis and his Singapore-based ship husbanding company, Glenn Defense Marine Asia, in Francis’ relations with top Navy brass. In 2012 and 2013, Breslau provided Francis with public relations consulting services, authored, reviewed or edited at least 33 separate documents; crafted at least 135 emails providing advice to Francis; drew up at least 14 instances of “talking points” in advance of meetings between Francis and high-ranking U.S. Navy personnel; and “ghostwrote” numerous emails on Francis’s behalf to be transmitted to U.S. Navy personnel, court papers show. Breslau also consulted with Francis on how best “to create relationships with five Navy admirals and win or maintain lucrative Navy contracts” for Glenn Defense Marine Asia. Francis pleaded guilty in 2015 to bribery and fraud charges related to providing a plethora of gifts to U.S. Navy officials, including travel accommodations, hotel stays, alcohol, prostitutes, Cuban cigars and more, in exchange for directing contracts toward his firm and providing him with confidential information on Navy operations and personnel. To this point, 33 defendants have been charged in the scandal, and 22 have pleaded guilty, according to federal prosecutors. In addition to the six-month sentence, Breslau must pay $65,000 in restitution to the Navy, a $20,000 fine, and perform 250 hours of community service.